Yurbuds Inspire 400 for Women Sport Earphones at Bodybuilding.com - Best Prices on Inspire 400 for Women Sport Earphones! Rock your workout with sweat-proof in-the-ear sport earphones designed to fit women’s ears. TwistLock® Technology and FlexSoft® Comfort Fit guarantee yurbuds® Inspire® 400 For Women won’t hurt or fall out, while JBL® Signature Sound with PureBass Performance amps up your music. Exclusive Quik Clik® Tangle-Free Magnets keep cords under control, while a 3-button command center and microphone provides one-touch music, volume, call and voice control for Apple® devices. Specially sized for smaller ears and available in fierce colors, Inspire 400 For Women will stay with you for every mile, every rep and every ounce of sweat. Guaranteed never to hurt, yurbuds® are ergonomically designed to avoid nerve rich areas of the ear for long-lasting comfort. Made with medical-grade, flexible silicone, they are ultra-soft and comfortable for hours on end. yurbuds® are ergonomically designed to allow in ambient noise so you’re aware of your surroundings during active use. Exclusive to yurbuds®, our patented TwistLock® Technology provides a secure fit that is guaranteed never to fall out even during the most rigorous physical activities. 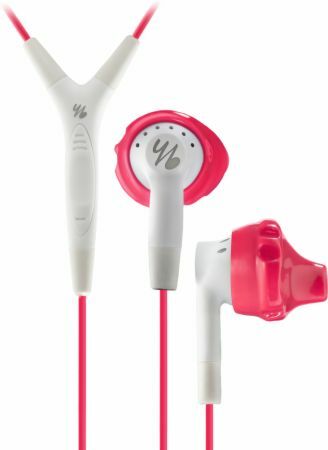 yurbuds® researched, sized and shaped our female line specifically for women's ears. Exclusive to yurbuds®, Quik Clik™ Tangle-Free Magnets make your sport earphones ready to wear and ready to store at any time. The sweat and water resistant 3-button microphone system provides a new level of convenience for the multi-tasker. Through the click of a button, you're able to control phone calls, music tracks and volume without breaking from your work-out. Compatible with Apple® iPhone®, iPod®, and iPad® devices only. yurbuds Inspire 400 Sport Earphones, carrying pouch and 2 pairs of enhancers. No Inspire 400 for Women Reviews Found.